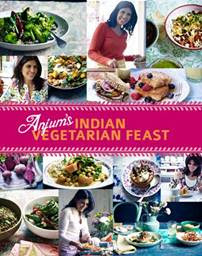 Recently I was invited to review Anjum’s Indian Vegetarian Feast by author Anjum Anand. Presenter and author Anjum, who grew up in London and has lived and worked throughout the world, cites her real love as home-cooked Indian food. Raised by a vegetarian mother, she married a strict vegetarian and is now raising her children as exclusively vegetarian. Therefore, unlike other chefs who write vegetarian cookery books as a gesture towards a different audience but display their ignorance of vegetarianism by including ingredients like animal rennet in their recipes, Anjum has a secure knowledge of vegetarian ingredients and has had a lot of practice at vegetarian home-cooking. It’s always lovely to find a recipe book which is exclusively vegetarian and where I know that I am not going to have to by-pass the on-veggie half of the book, or scrutinise the contents of each recipe to see whether I can cook it or not, so I couldn't wait to see what Anjum's book had in store. I always find it quite ironic that around two thirds of Indian people follow a vegetarian diet, and yet if you walk into any ‘Indian’ restaurant in the UK, most of the dishes on the menu are not suitable for vegetarians as they are tailored to a UK market and are not really a true taste of India. Being a big fan of Indian food, I was eager to find out more about authentic Vegetarian Indian recipes, rather than trying to recreate those you typically find out on a takeaway menu. Authentic Indian cookery involves mainly lentils, beans, and dairy products, all of which are in abundance throughout Anjum’s Indian Vegetarian Feast recipe book. The book is well organised into different sections - breakfast and brunch, drinks, starters and snacks, salads and grills, vegetables, cheese, pulses and eggs, gorgeous grains, on the side and divine desserts. This is great as it allows you to easily find a recipe for the appropriate occasion. Anjum cites her ‘desert island ingredient’ as Bengal Gram (Chana Dal) – a type of lentil which is so versatile that it can be made into curry, a side dish, or dessert. The book is full of interesting glossy pictures and mouthwatering recipes including Vegetarian Kedgeree, Mushroom and Vegetable Kathi Rolls, Kerelan Coconut Curry, and the rather eye-catching Mango, Pomegranate, Berry and Coconut Trifle. As I found out from my friend Sheba, from Absolute Indian, who gave me a lesson on Indian Kerelan cooking, Indians are the alchemists of the spice rack, and Anjum uses plenty of whole and ground spices in her recipes which can be found in large supermarkets or specialist stores in the UK. Anjum recommends increasing your spice larder by one spice a week to build up a whole and ground spice collection - what a good idea and one I shall be trying! I really love this recipe book, first and foremostly because it is vegetarian, but also because the recipes featured are interesting, varied and look absolutely delicious. I also loved the food styling of the photographs, the tone of the book and just everything about it. For anyone who loves indian cookery, or is a vegetarian, I think that this book would make a great gift as it is a must for their kitchen shelf. As well as a plethora of recipe books, Anjum also has her own range of spices and ready-made sauces which feature on her website The Spice Tailor. Anjum's hardback recipe book is available from a variety of retailers and has an RRP of £19.99. Disclousure: Anjum's Indian Vegetarian Feast recipe book was offered in consideration for review. All views are my own and I was not asked to write this article.